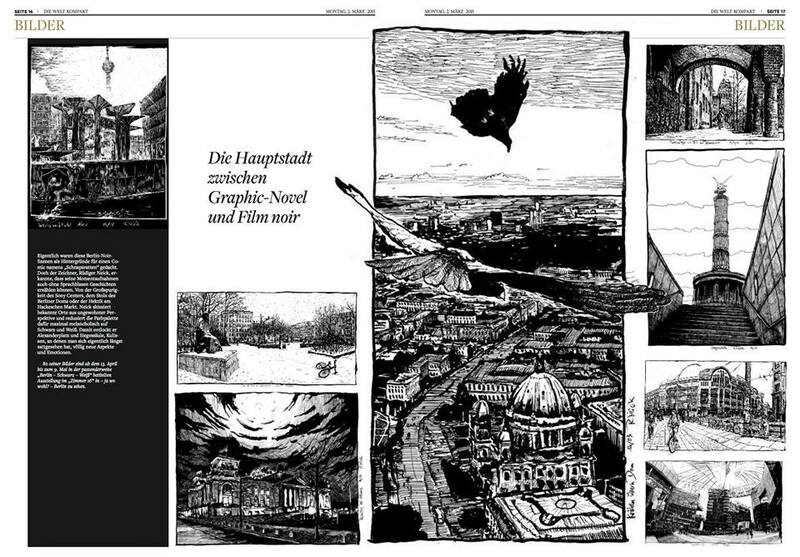 "Here we loke at one of Rüdiger´s projects, a serie of graphic works, called “Berlin Noir” devoted certainly, to the german capital. Looking at Rüdiger´s works, which include not only ink drawings, but also scratchboard works, … ,his famous countryman Dürer comes to mind. But we will not fall into such naïve comparisons. Rüdiger`s style is as modern as possible. This is manifested in everything: the choice of the perspective, the shading manner and, if I may say so, the plot of images. Speaking about perspectives, look how “movie like”, in a good way, they are selected. Each drawing could be a strip of a graphic novel. The artist`s experience in such projects is evident. I especially like how precisely the artist has managed to grasp the so called “breath of the city”. He does not just convey the mood of the city, but also creates a real live city on paper. The city that will continue living its life the moment you turn away." "...Neick skizziert bekannte Orte aus ungewohnter Perspektive und reduziert die Farbpalette dafür maximal melancholisch auf Schwarz und Weiß. Damit entlockt er Alexanderplatz und Siegessäule, Kulissen, an denen man sich eigentlich längst sattgesehen hat, völlig neue Aspekte und Emotionen."